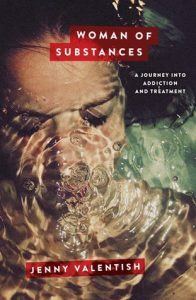 Woman of Substances is a terrific, engaging, and informative read. Well researched, it links together topics as varied as eating disorders, addiction, childhood trauma, sexual assault, internalised misogyny, and medical testing, painting a picture of a society failing women when it comes to mental health. Throughout Woman of Substances Jenny Valentish unpicks the complicated cause and effect relationship between societal structure and substance abuse by women. Valentish blends memoir with scientific research and interviews with experts. She never strays into titillation or self indulgence, which many memoirs of illicit behaviour do. All anecdotes about Valentish’s life are related back to broader discussions and her own behaviour is examined in critical detail rather than exalted. This cannot have been an easy book to write, it’s painfully raw in places, as she examines her past with brutal honesty. The sections on Valentish’s internalised misogyny are so important, and her own struggle is one so many women will understand even as some of her more extreme experiences are unknown. I was particularly interested in two angles of inquiry within the book. The first was the physiology of women and the ways in which substance abuse can both feed on and alter women’s bodies. The second was the structural issues in society which lead women into addiction, and then fail to provide the tools to help them out of patterns of behaviour. I learnt so much about my own body, that I really was not expecting from what appears at first glance to be journalist’s memoir about alcoholism (which it is, but is also so much more). The topics explored are diverse and thoroughly researched. There is also genuine, albeit brief, acknowledgement of the experience and challenges faced by trans women. The lack of research into the trans experience of substance abuse appears to have limited the exploration of the intersectional challenges faced by trans women. There is no question that Valentish is an accomplished writer, and the depth of inquiry into the female experience of drug and alcohol addiction is an important achievement. I strongly suspect this will be my top non-fiction read of 2017. Trigger warnings for: sexual assault (including underage/child), domestic violence mentions, and drug/alcohol abuse. There may be others, as this book deals with a wide range of confronting topics.